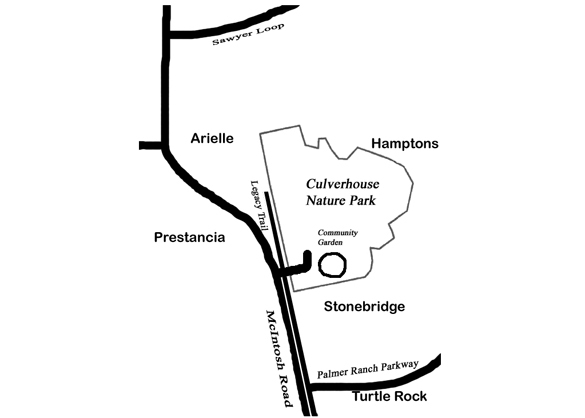 Culverhouse Community Garden | We are an organization of committed local residents who want to work as a gardening community to grow organic vegetables for our own health and the health of our families. We are an organization of committed local residents who want to work as a gardening community to grow organic vegetables for our own health and the health of our families. Take a look around and learn more about us and our connection to the Sarasota community. April: Bush Beans, Pole Beans, Caladiums, Lima Beans, Mustard, Okra, Peas. IFAS says: Continue planting warm-season vegetables such as eggplant, southern pea, bush bean, sweet potato, and summer squash. Watch irrigation if the weather is dry. View Resources page for great gardening articles and links that are sure to help you be a successful gardener. Which tomatoes grow best in CCG? The answer is on the Resources page! Click Photo History to learn how we transformed pastureland into a community garden. Enjoy PHOTOS of our founding members. Read NOTES of early organizing meetings! On our FAQs page, you will find documents describing our solar water system, battery maintenance, compost system, and more. -- KOHLRABI & CARROT Fritters. -- ESCAROLE Sausage Bean Soup. What is an ACTIVE GARDENER? An active gardener in the Culverhouse Community Garden plants and harvests on a timely basis, keeps their plot weed free, and keeps the four surrounding paths weed free and well mulched. An active gardener visits minimally twice a week. For prolonged absences, the gardener notifies the managers, and arranges for someone to harvest and maintain the paths and plot or closes the plot by clearing and covering as per CCG requirements. In keeping with the spirit of a community garden, an active gardener contributes to the upkeep of the common areas of the entire garden. garden. An active gardener is responsible for recording common area work time, performing a minimum of 16 hours as required by the Sarasota County Community Garden Program.